Listed Grade II by Historic England 12, September 1990, upgraded to Grade II* on 12, August 1993. The Grimsby Ice Factory including railings (Formerly Listed as: FISH DOCK ROAD, The Docks (East side) The Grimsby Ice Factory) GV II* Ice factory. 1900-1 with extension factory of 1907-8 and later alterations. By WF Cott, consulting engineer, for the Great Grimsby Ice Company Limited. Red brick with blue brick and ashlar dressings. Slate and glazed roofs; copper domes on north unit. Chamfered blue brick plinth. Approximately rectangular on plan, comprising 2 linked factories separated by a passage (formerly carrying a railway), cutting across at an angle. Factory has frontages to Gorton Street, Fish Dock Road, Stuart Wortley Street and the railway passage. EXTERIOR: main front to Gorton St., facing Fish Dock Number 2: 2-storey 12-bay range to the left, and a single-storey 8-bay range to the right. Left range is divided into 3 sections: to the left are two 4-bay pedimented fronts with a narrow linking bay between topped by a short square tower, and to the right is a 3-bay parapeted section. Plinth to the sections on the left carries a narrow cantilevered balcony with plain iron railings. Pedimented sections have angle pilasters, the outer ones rising to small square turrets, the inner ones flanking the linking bay which has a central full-height keyed round-arched blind panel. The pedimented fronts form a handed pair, each with a full-height pilastered blind arcade of 4 arched panels with ashlar keystones and rubbed-brick impost mouldings, the outer panels round-arched, the wider twin central panels with elliptical arches, one of which in each section has been replaced by a first-floor loading door beneath a lintel. Ground floor: central 2 bays to each section have segmental relieving arches and single sliding loading doors, the outer bays have round-headed glazing-bar windows. Large square cast-iron tie-bar ends at first-floor level with lettering “G G I Co Ld”. Round-headed blind first-floor openings. Moulded brick cornices and friezes, that to right with painted inscription “THE GRIMSBY ICE CO LTD”; traces of former painted lettering to left frieze. Both pediments have a blind keyed oculus, stone coping with central finial. Central tower has angle pilasters with blind slits, small central opening with a bracketed wooden bell-frame below, and a moulded and dentilled brick cornice. Angle turrets have panelled sides, moulded cornices and pyramidal ashlar caps. 3-bay section to right also has a full-height pilastered blind arcade of recessed panels, the outer bays round-arched, the inner bay elliptical-arched, each containing keyed arched openings with moulded imposts: a blind opening to ground-floor centre, the openings to the left bay with glazing-bar windows, the others partly blocked and with various inserted C20 openings. Rebuilt coped parapet. These left-hand ranges have first-floor iron balconies and walkways, and a pair of overhead gantries with ice conveyors crossing the street to the dockside. The lower 8-bay range to the right has a chamfered plinth and recessed panels to each bay, the 2 left bays rendered and with inserted C20 ground-floor doors, the 5 bays to the right with round-headed windows with glazing bars, stone sills and flush sill band, moulded brick imposts and impost band; blind panel to far right with sill and impost band. The north factory unit, beyond the railway passage, has an angled 2-storey section with fronts to the passage and to Stuart Wortley Street (described below). Behind this is a taller section facing Gorton Street, with a 3-bay pedimented section with a tower adjoining to the left, both with angle pilasters. The tower has a narrow round-headed blind panel to each side with an elongated keystone, moulded brick cornice, coped parapet; central copper dome surmounted by a flagpole, flanked by 4 small domes. Pedimented section has pilastered arcade with moulded brick imposts, round-headed keyed arches containing round-headed recessed panels, those to right with an inserted door and window. Tympanum has central blocked round-arched opening with keystone, stone coping with central ball finial; angle pilaster to right capped with small square turret. Secondary front to Fish Dock Road: north factory unit, from left, has 2-storey 5-bay section and slightly taller 2-bay section with coped parapets, and a symmetrical 3-storey 5-bay section to right with central 3 bays topped with a pediment. Sections to left have full-height recessed panels to each bay; the first 5 bays with round-headed blind openings to ground floor and square-headed blind openings to first floor beneath cambered brick arches, all with sills. 2 bays to right have round-headed glazing-bar windows to ground floor, similar openings to first floor with lunettes above blind panels. Pedimented section, flanked by pilasters, has 3 recessed segmental-arched panels below containing 3-light ground-floor windows with glazing bars beneath heavy steel lintels, chequered brick panels above and 3-light first-floor windows with sills and glazing bars. Above is a pilastered blind arcade of narrow round-headed panels with moulded brick imposts and ashlar keystones, containing recessed round-headed glazing-bar windows with sills. Moulded brick cornice and frieze with painted lettering “THE GRIMSBY ICE COMPANY LTD”. Pediment has moulded brick cornice, small oculus with elongated keystones, stone coping with central ball finial. Flanking pilasters capped with square turrets with blind panels, moulded cornices and pyramidal caps. Single flanking bays have continuation of cornice and frieze and pilasters capped with turrets: bay to left has a round-headed ground-floor entrance with double doors beneath a steel lintel, chequered brick tympanum and keyed arch; bay to right forms one side of an angle turret beside the railway passage. South factory unit, to right of the railway passage: has front of 2 builds to Fish Dock Road. Earlier section to left has 1:3:1 bays with recessed panels to each bay. Wider outer bays have keyed round-headed ground-floor openings with glazing-bar windows, that to right incorporating a central door; single circular windows above with glazing bars. 3 narrower central bays have recessed round-headed panels containing ground-floor windows beneath lintels, and round-headed first-floor windows, all with stone sills and glazing bars. Coped parapet. Section to right has 2 large glazed panels, each of 6 lights, with 3 tiers of windows; coped parapet. Stuart Wortley Road front of north factory unit: 2 storeys, with a tall 3-bay central section flanked by lower 6-bay sections. Recessed panels to each bay. Left section has 2 full-height blind panels and a wide ground-floor entrance to the right beneath a steel lintel, with 4 recessed panels above containing round-headed first-floor windows with glazing bars; parapet with later C20 concrete coping. Central 3-bay section has pilasters between bays and angle pilasters capped by square turrets. Ground floor: pair of tall keyed round-arched openings to left, one with loading door, the other partly blocked and with an inserted window, both with steel lintels at impost level and chequered brick tympana. Round-headed glazing-bar window to right. Above, recessed round-headed panels with keystones and moulded brick imposts, containing blind round-headed openings with sills, that to left with a small inserted door and iron balcony. Coped parapet ramped up to pedimented front to Gorton Street to left. Railway passage elevations: northern factory unit, from left, has 20-bay section of 2 and 3 storeys, a single-bay tower, and a low 2-storey range with 5 irregular first-floor openings. 20-bay section has blue brick to ground floor, recessed panels to each bay. 4 bays to left have 3-light ground-floor and first-floor windows with glazing bars beneath steel lintels, separated by chequered brick panels. Above are round-headed openings containing lunettes with sills above blind panels, one with a door to an iron gantry walkway linked to the southern factory unit. 15 bays to right have round-headed openings to ground floor, one with a blind panel, another with an inserted door, the others with glazing-bar windows, some beneath louvres. Above, round-headed blind panels with blind lunettes with sills. Stepped brick eaves cornice (for turret see Gorton Street front). Section to right has blocked ground-floor door to left of centre and wide 4-light wooden first-floor window with glazing bars and boarded apron beneath steel lintel; to left, a pair of blind square-headed first-floor openings; to right, 2 bays with recessed panels containing round-headed windows to each floor; coped parapet. Railway passage elevation of southern factory unit has 5 2-storey parapeted sections of varying height, with 4, 5, 3, 2, and 5 first-floor openings. 3 sections to left have 3 square-headed doors, one blocked, and a blocked round-headed door, round-headed and segmental-headed glazing-bar windows to ground and first floor. Taller 2-bay range to right of centre has recessed panels containing round-headed glazing-bar windows, that to first-floor right with a door and gantry walkway to northern factory unit. 5-bay section to right has full-height recessed round-headed panels with ground-floor and first-floor glazing-bar windows similar to adjoining Fish Dock Road front. INTERIOR: massive girder construction supports 6 rows of refrigeration tanks on 2 floors complete with machinery for producing blocks of ice. The factory was converted to electricity in 1933 and compressors remain in the Compressor Room. The northern unit has been partly cleared but massive girder construction remains. HISTORY: built following the amalgamation of the Grimsby Ice Company with the Co-operative Ice Company. The factory supplied ice for fish packing. The overhead gantries on the Gorton Street front carried ice into the dockside fish-landing building opposite. Ceased production 1990. The Grimsby Ice Company was one of Grimsby’s leading fishing companies, and also built the Fisherlads’ Home, for fishing apprentices, in Convamore Road (qv). 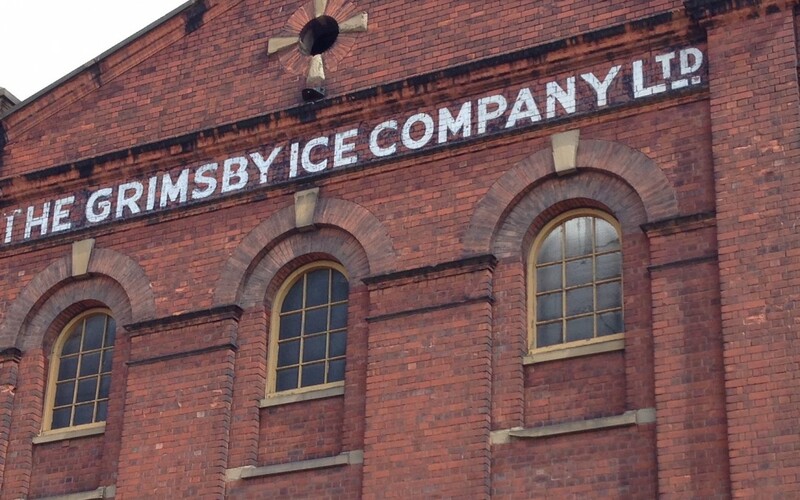 This ice factory illustrates Grimsby’s importance as the world’s foremost fishing centre in the earlier C20. This building is understood to be the earliest remaining ice factory in the UK. Furthermore it is believed to be the sole survivor, complete with its machinery, from this period. (Ambler R W: Great Grimsby Fishing Heritage – a brief for a trail: Grimsby Borough Council: 1990: pp34-35; National Fishing Heritage Centre: Great Grimsby Heritage Trail: 1991-).